A birthday celebration during a Little Pink retreat at Ocean Lakes Campground. Truly one of the highest callings in life is to offer hope and encouragement to others. This week, I watched a glorious outpouring of this as ten breast cancer survivors and their families gathered for a retreat at Ocean Lakes Campground along South Carolina’s coast. These women came due to the kindness of a non-profit organization called Little Pink Houses of Hope and the generosity of people who donated their beach homes so these families could enjoy a vacation in the middle of their fight with cancer. Little Pink was founded by Jeanine Patten-Coble in 2009 after her own battle with breast cancer as a way of providing survivors a chance to reconnect with life. During week-long retreats in 11 locations throughout the U.S., survivors and their families enjoy a relaxing atmosphere away from the stressful routine of cancer treatment. Each retreat is thoughtfully designed to create a family-type environment where participants can enjoy activities, games and meal times together. The applicants, who can apply for this program via the organization’s website, come from all across the United States. While there are various qualifications to be met in the application process, all of them must either be currently in the process of receiving treatment or have had treatment within the past year. I spoke with Kathy Gates, director of this year’s Little Pink retreat at Ocean Lakes. Kathy, a former teacher from Elon, North Carolina, has been involved with the organization for three years. She heads up a training program for directors, and this is her second year as a retreat director here at Ocean Lakes. She was generous in her praise of the local community and the volunteers who work together tirelessly to make these retreats successful. Up and down the coast, from Georgetown through the greater Myrtle Beach area, this community has opened their arms and their wallets for the families of Little Pink. From food vendors who donate meals, to local businesses who donate food, to churches who send volunteers to help with anything from babysitting to transportation, love is demonstrated in an outpouring of services for those who are in various stages of cancer treatment. One of those people who benefited from this hope is Kathleen Walsh from Toledo, Ohio who came to her first Little Pink Retreat as a participant five years ago. Kathy had been diagnosed with cancer right before a 20th anniversary get-away she and her husband had planned to take. Their trip was cancelled, but a year later, she and her husband were accepted for a Little Pink retreat and celebrated their 21st wedding anniversary by a renewal of their vows on the beach at Ocean Lakes, with all the other retreat families in attendance. 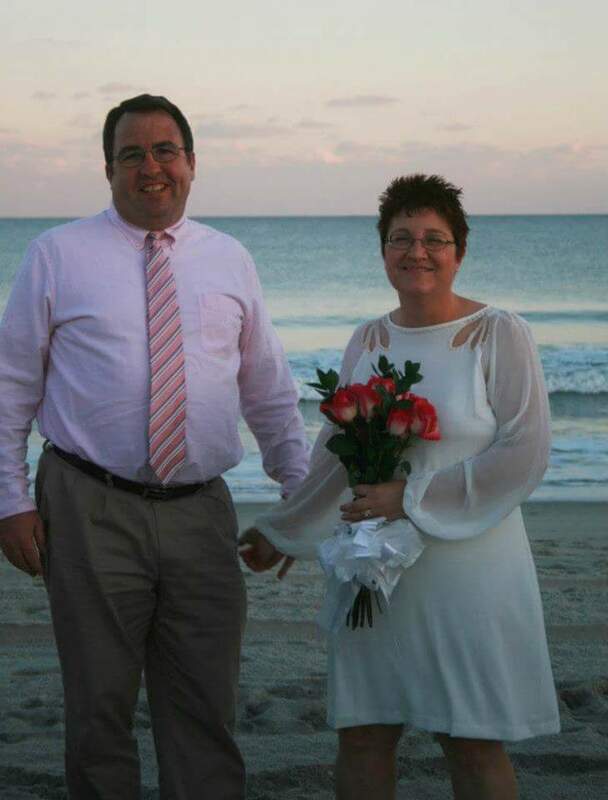 Kathleen Walsh and her husband during the renewal of their marriage vows on Surfside Beach. For the past four years, Walsh has served as a volunteer for Little Pink retreats and is here at Ocean Lakes this year with daughter, Kelly. Her enthusiasm to reciprocate the love and support she received from others while going through her own battle with cancer is clearly evident from the joyous enthusiasm she portrays when talking about the program. “As alumni, we are continually being challenged to do things we’ve always wanted to do. For me, that was to run a marathon,” she explained. “Four months ago I started training and this weekend I’m running the half marathon in Myrtle Beach,” she enthused. “And I raised enough support to pay for another family’s stay at a Little Pink retreat,” she added with a smile. Bethany Goodman and her "miracle baby" who was born during her battle with breast cancer. For Bethany Goodman, a first-timer at the Little Pink retreat, she can’t say enough about the kindness and love she has experienced from everyone. Bethany was diagnosed with cancer during pregnancy, two days before Christmas, at age 31. After the baby was born she had a double mastectomy resulting in a severe infection. “I almost died,” she declared. Goodman, who has two other girls, ages 6 and 7, in addition to her one-year-old daughter, heard about the retreat through a friend who is also a breast cancer survivor. They researched Little Pink’s website and filled out an application with fingers crossed. Happily, they were chosen to participate. When asked how she’s coping with three little ones on a vacation, she replied,” These people are absolutely wonderful. They take the baby when I eat and take my older daughters on activities so the baby can nap. They stocked my house full of food and they even celebrated my girls’ birthdays with a cake,” she exclaimed. “We came here not knowing what to expect and even had activities planned outside of the group activities, but now we don’t want to be away from them. A lot of people try to understand what it’s like to go through cancer, but these people, they get it because they’ve been there,” she stated. Homeowners donate their homes for a week-long vacation for breast cancer survivors and their families. In addition to the volunteers who help throughout the retreat, the homeowners play a significant role in the success of Little Pink . I spoke with Mark and Anita McCoy who have donated their home twice for a retreat here at Myrtle Beach. They said they initially bought their home here at the coast, not only for their own pleasure but also as a place where family and friends could come to relax. It seemed only natural, then, that they opened their home to host a family for such a worthy cause. The rewards are plenty, according to Mark, who says, “The joy and excitement the families show, especially the kids, when they enter their beach house for the week is one of the best parts of the entire donation process. Hearing the kids say, ‘look at this room, this is mine!’ or hearing a survivor say, ‘this is so beautiful’ are priceless comments,” he adds. The McCoys also noted a highlight for them is the way families can forget, even for a moment, about the disease which affects them all. “Being around other survivors for a week and feeling the passion each one has for life is a huge encouragement for these women and it embraces the overall mission of the retreat,” Mark added. Golf carts are made available for families to use during the retreat. It’s clear to see the unity of everyone working together for the common goal of “promoting breast cancer recovery by offering opportunities for survivors to reconnect and celebrate life”, which is Little Pink’s mission statement. This was especially noticeable in a noon meal where everyone gathered around the young daughters of Bethany Goodman in a rousing rendition of “happy birthday to you” complete with cake and balloons. It felt like a family celebration. “When I think about my work, I’m amazed I get paid to do this. I am so blessed to see everyone use their God-given gifts to bless these families,” director, Kathy Gates, summarized. And that’s exactly what it is - each one doing their part to provide hope and encouragement. It feels like a good philosophy for all of us to adopt in life. Great NYC Flower Delivery shop around here! Nice selection including some varieties not usually available at other places (ranunculus, hyacinth, curly willow, etc.) The florist was super friendly and helpful, selecting the best stems and putting together a really beautiful bouquet.